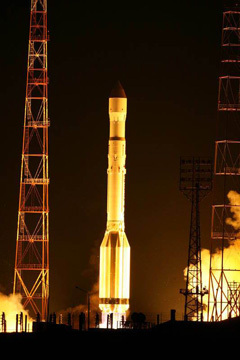 Three more Glonass navigation satellites were dispatched to space Monday, ensuring the network continues providing positioning services to Russian territory as officials seek to expand it to global coverage. 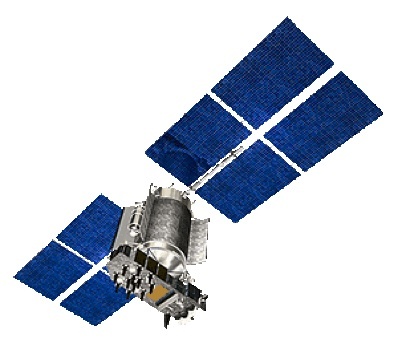 The Glonass constellation is Russia's counterpart to the U.S. Global Positioning System. Glonass satellites provide users with navigation coordinates, velocity and precise timing information. The replenishment satellites blasted off aboard a Proton rocket at 2119 GMT (4:19 p.m. EST) from the Baikonur Cosmodrome in Kazakhstan. The Proton blazed a dazzling trail into the sky above Baikonur, where it was just after midnight local time. The first stage's six main engines gave way to the Proton's second stage about two minutes after liftoff. The Proton flew out of sight of ground tracking cameras about six minutes into the mission. Within the first 10 minutes of the flight, the rocket deployed the Glonass payloads and the Block DM upper stage in space. The Block DM fired its main engine twice to push the Glonass satellites into a circular orbit 12,000 miles high with an inclination of about 64.8 degrees. The upper stage released its grasp on the Glonass spacecraft around 0052 GMT Tuesday (7:52 p.m. EST Monday), according to the Russian Space Agency. According to a Russian Space Agency Web site, there are 18 operational satellites in the fleet as of March 1. Two more satellites are out of commission for maintenance. The constellation is spread among three orbital planes, each designed to contain eight satellites to maximize global navigation coverage. The satellites launched Monday are headed for Plane No. 3, according to the Russian Space Agency. Global service requires 24 healthy Glonass satellites, while complete coverage of Russian territory demands 18 operational spacecraft. Three Glonass platforms were delivered to orbit during another Proton launch last Dec. 14, and another trio is scheduled for launch in August, Russian space officials said. Monday's mission was the third Proton flight of the year. Between 12 and 14 Proton launches are on the books for 2010, including commercial and government missions. The next Proton launch is scheduled for March 20 with the EchoStar 14 direct broadcasting satellite for the United States.